Posted on February 25, 2015	by Katy K.
Around the World by Matt Phelan. Candlewick Press, 2011. 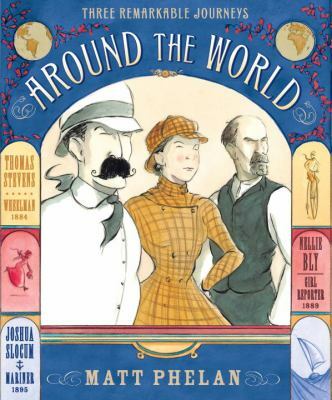 In the late 19th century, Jules Verne’s still-entertaining Around the World in 80 Days rocked the world with the idea that one could easily and quickly travel around the world. It was fiction when it was first written, to be sure – but could it be done? Phelan’s historical graphic not-a-novel recounts the stories of three real-life adventurers who made it around the world. We first meet Thomas Stevens, a young Californian who used all the savings from his mining job to buy himself a Columbia Standard bicycle in order to ride across the United States. It was 1884, and the still-new invention cost $110, which an on-line inflation calculator tells me would be $2,444 in today’s dollars. He learned to ride the bicycle with its giant front wheel along the way, and decided when he got to Boston to continue his journey around the world – by ship across the oceans, and by bicycle across Europe and Asia. In 1888, Nellie Bly, the already-famous intrepid reporter, decided to try to go around the world in 74 days, becoming in the process the first solo woman to travel around the world. Travelling with just a carpet bag, primarily by train and ship, she battled sexism, seasickness and storms. Her progress was anxiously followed by newspaper readers around the world. Very different from these energetic young adventurers, Joshua Slocum was a widowed grandfather when, in 1895, he decided to sail solo around the world. His journey lasted for years instead of months, but was no less entertaining to read about. As with Phelan’s 2013 book Bluffton, the story is illustrated in energetic pencil filled with soft watercolor washes. Phelan includes his sources, both the memoirs all three travelers wrote and more recent books about them. Nowadays we think ourselves the most modern generation ever – and while of course we are, it’s easy to forget how exciting and world-changing things like trains, bicycles and steamships were when they were first invented. Phelan’s book reignites that old excitement in a book that feels vintage while using modern picture storytelling and language to make it easily accessible to today’s readers. But if you’re giving this to a kid (and you should) you can leave out the important historical and educational aspects, and just tell them about the adventure. There’s plenty of it. This entry was posted in Books and tagged adventure, youth graphic novels, youth nonfiction. Bookmark the permalink.